Is your talent acquisition technology living up to its potential? Find out how national restaurant chain and America's #1 buffet and grill, Golden Corral, serves up more applicants while bringing insight into their sourcing effectiveness and staffing strategies. High volume recruiting just got easier! 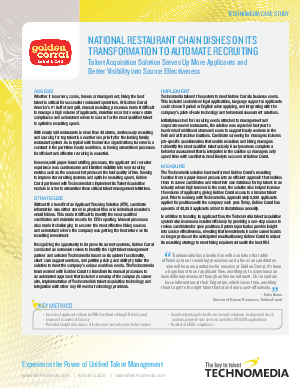 Download our complimentary case study to see how Golden Corral transformed and automated their recruiting function with best-practice technology.